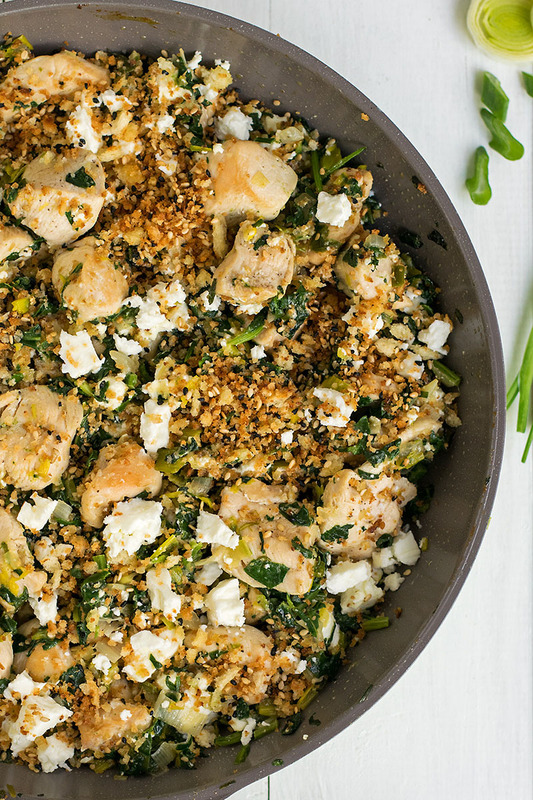 This super delicious, low-fat and easy chicken and spinach recipe is made in a skillet and will be your next favorite dinner! “I see you, you’re doing a good job”. Before continuing on with the chicken à la spanakopita recipe, please allow me to thank Akhila from Pepper Delight, who was one of my first friends and the one that first nominated me for the Saveur Blog Awards 2017. Thanks, Akhila! Sara from Add a little lemon and her amazing writing. Kathryn from Cardamom and tea nailing modern Assyrian cooking. Maryam from Pakistan Eats celebrating Pakistani cuisine. Esteban from Chicano eats and his bold, vibrant images. Ankiet from Belly over mind with his nostalgic, moody shots. After this pappardelle à la spanakopita recipe, which turned out soooo good, I knew I had to play with the concept of spanakopita for one more time. And since chicken is a favorite ingredient of mine, a chicken skillet recipe that comes together in no-time was more than obvious! 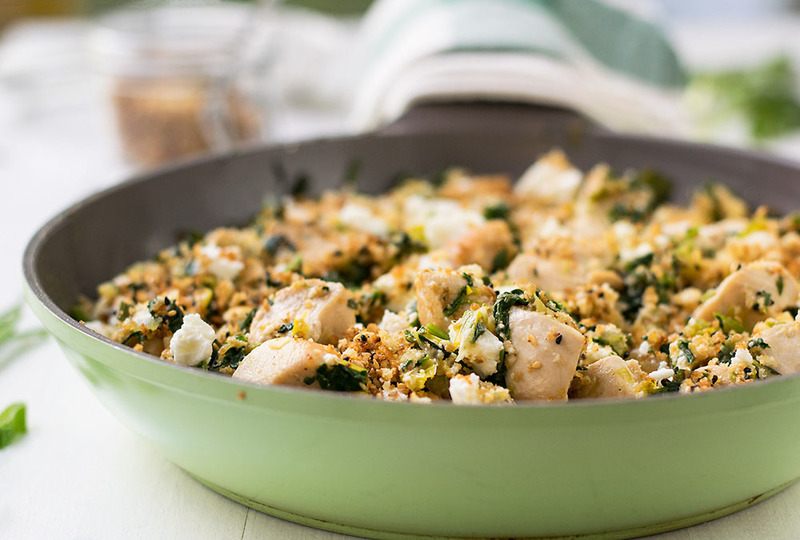 This dish is perfect for a weeknight dinner since it can be made in less than 30 minutes and you only need one deep skillet to get the job done! You can serve it with thick slices of toasted bread with olive oil, tomatoes, and oregano (you can see how pretty they are in my baked eggs in potato nests post) or with some fluffy rice. Oh, and I know I have probably overdone it with the toasted breadcrumbs in these pictures, but trust me this chicken tastes way much better than it looks! As you probably know, spanakopita is the Greek word for spinach pie. It is usually made with phyllo and it’s one of the most famous Greek recipes. Every time my mom wants to make it, she takes a walk to the country side and harvests wild greens and aromatics. Yes, she doesn’t just use spinach, because spinach has a rather neutral taste. She wants depth of flavor, so she makes sure to gather a couple of different varieties of greens, other sweet, other bitter and some with an intense aroma. I won’t make you go and harvest wild greens and aromatics from the countryside, but I will ask you to get some leeks, a few green onions, a large onion, and some chives if possible. And of course some good feta cheese! 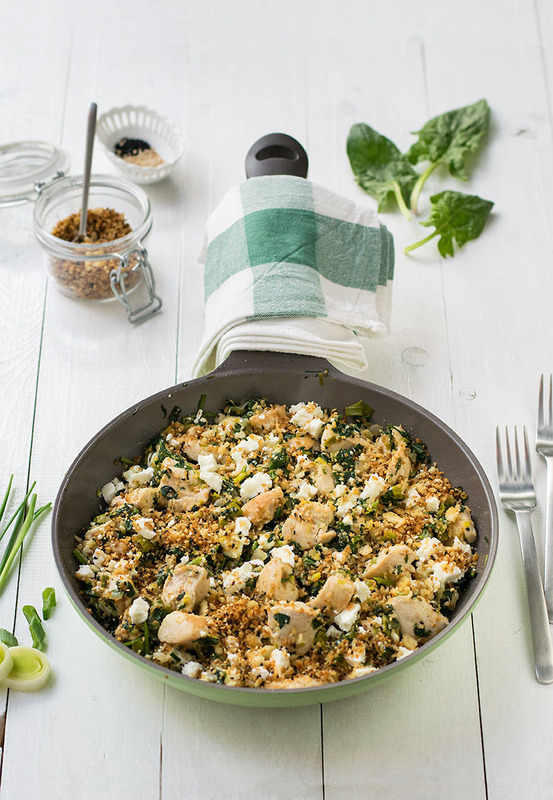 The basic concept of this recipe was to make something like a spinach pie with chicken but without all the fuss. For this purpose, toasted breadcrumbs are wonderful, because they save you all the trouble of managing the phyllo sheets and baking the pie while at the same time they provide all the taste that normally the phyllo provides but with less oil/fat (= fewer calories)! Other than that, the chicken breasts are cooked with some olive oil and then get mixed with the ingredients typically used for filling the spanakopita. You can make this recipe gluten-free by using gluten-free bread crumbs. When sautéing onions, it is a common practice in Crete to add some water. This helps the onions not to burn, especially if using high heat. Cook the chicken pieces in one layer without turning them until they brown well and caramelize from one side. Then flip them and continue until cooked through. 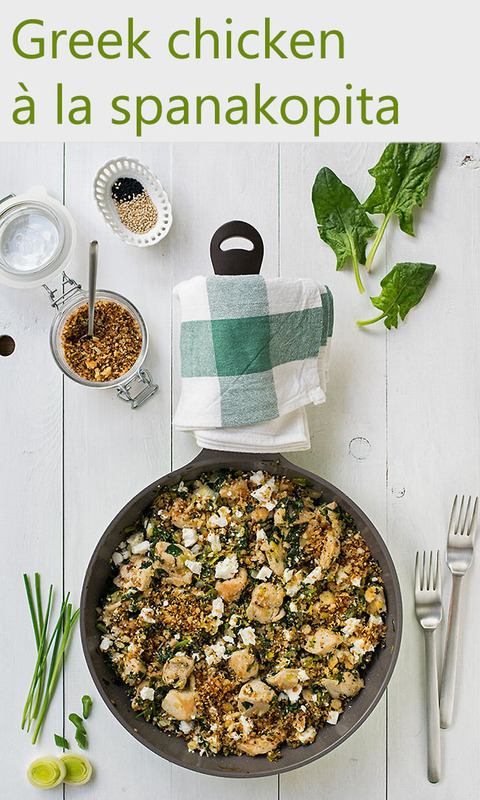 When adding salt, take into consideration the saltiness of the feta cheese. 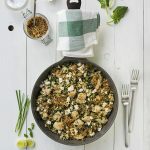 Place the olive oil and the bread crumbs in a deep skillet and heat over medium/high heat, stirring constantly until well browned and fragrant (about 5 minutes). Add the sesame and black sesame and cook for 1-2 minutes more. 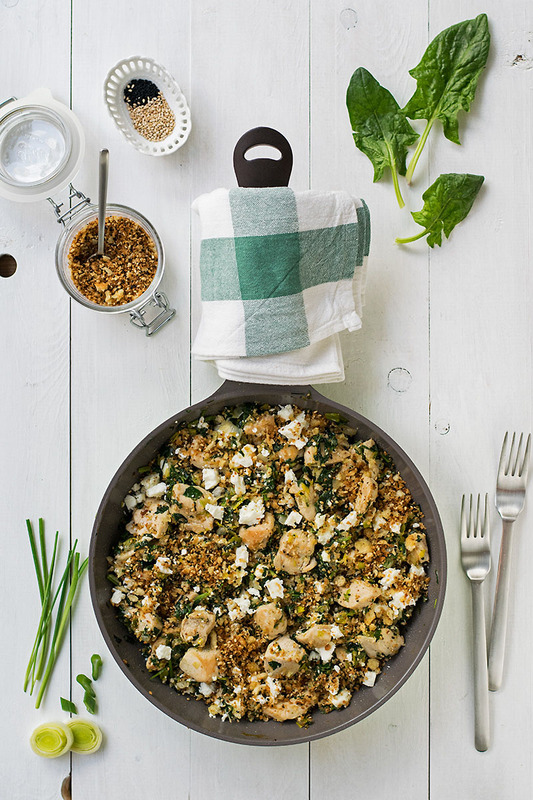 In the same skillet, transfer chicken pieces and drizzle with 1-2 tablespoons olive oil. Sauté in one layer over high heat until golden brown on one side, then flip and cook the other side (about 3 minutes each side). When you are sure that the chicken is cooked through, transfer to a clean bowl and set aside. Cook the leek, onion, and green onions with 1-2 tablespoons olive oil over medium heat for about 10 minutes. If you notice it starts to burn, add a splash of water. Add the spinach, chicken, chives, salt, and pepper and cook stirring often until spinach wilts, about 5 minutes. Add the feta cheese and stir just until it starts to soften. Remove from heat and serve immediately, topping with the bread crumbs. Eat! Once again, I’m so glad for you & Hearty Congratulations on being the Finalist! I hope to soon read a similar post from you after winning it. All the best !!! I see you and you’re doing a phenomenal job! So excited for all of us! Also, this dish looks fabulous. Can’t wait to try it! And I”ll say it again: it is a great honor to be among all of you guys!